In the last post in this series, we discussed the convergent evolution of echolocation in certain bats and toothed whales. 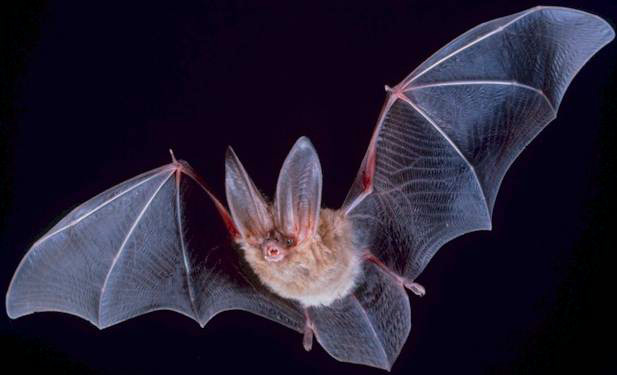 For bats, echolocation allows them access to a rich food source (insects) at a time of day when there are few competing predators, and ample prey (since many insects are more active at night for the same reason – there are fewer nocturnal predators). As bats slowly gained the ability to echolocate and hunt at night, this innovation would naturally affect their prey species. Any variation within prey populations that was advantageous for avoiding predation would be selected for, and increase in frequency over time – and contribute to a change in average characteristics of the prey species. These shifts in prey characteristics would then select for variation within bats, and so on – effectively joining predator and prey into a relationship where each acts as the major selective force on the other. Such a relationship is an example of coevolution – a close relationship between two species where each shapes the evolution of the other. For predators and prey, one can imagine their coevolution as an “arms race,” with improving weapons for predation matched by improving defenses. Since echolocation is such an effective tool for preying on nocturnal insects, it’s not surprising that there are a number of adaptations in various insect species that improve their odds of avoiding being eaten by bats. The most basic of such adaptations is a means by which insects can hear the ultrasonic frequencies that bats use for echolocation – in other words, some sort of auditory sensory organ. These sensory organs, known astympanal organs, employ a membrane that vibrates in response to sound waves, and associated nervous system cells that convert the vibrations into changes in electrical potential that are perceived by the insect’s brain as sound. Since even a rudimentary ability to detect ultrasonic sound would be a distinct advantage when faced with an echolocating predator, it’s not overly surprising that tympanal organs that can detect ultrasonic frequencies have arisen independently numerous times in distinct insect lineages (providing yet another widespread example of convergent evolution). Tympanal organs can be quite simple – a small membrane and a few associated nervous system cells – lending credence to their being evolved over and over again. Beyond merely hearing a bat’s approach, insects have a range of adaptations that are coupled to detecting ultrasonic frequencies. In many cases, erratic flight patterns (such as dives, loops, and even complete free falling) are triggered by detecting echolocating bats in close proximity. Detecting the weaker signals of more distant bats often produces a more basic survival mechanism – simply flying away from the source of the sound. In both cases, natural selection acting on variation within insect populations is the likely source of these adaptions – as bats began to use echolocation for hunting insects, insects that possessed variation that reduced the chances of successful predation would reproduce at a greater rate, honing these responses over time to the form we observe in the present day. One innovative mechanism that some moth species have developed as a defense against echolocating bats is to use their tympanal organs to produce ultrasonic sound in response to detecting the ultrasonic cries of echolocating bats. In some moth species, this acoustic response warns bats that the moths are toxic and unfit for consumption. Since bats can learn to avoid such moths, it makes sense for toxic moth species to advertise their presence so they are not mistaken for palatable species. Since vivid colors and other visible displays (such as are often found on other toxic insects) are not an option for alerting would-be predators at night, characteristic sounds are employed instead. To achieve this, the tympanal membrane is actively vibrated by the moth, producing ultrasonic waves that the bat will hear (since bats are listening to these very frequencies for the purposes of echolocation). Bats come to associate the resulting acoustic signature of the moth with their toxic, unpalatable taste, and in the future avoid other moths making the same sound. On average, then, moths making this sound are more likely to avoid predation by bats (though some members of the moth species will have to pay the ultimate price for educating naïve bats). One species of moth, the tiger moth Bertholdia trigonia, takes this approach to a whole new level. Not only does it emit ultrasonic noise in response to an approaching bat, it does so in a way that directly interferes with the bat’s ability to echolocate. Moths that are merely using a warning sound to advertise their toxicity emit signals in a pattern that does not produce interference with bat echolocation, but Bertholdia emits ultrasonic bursts well suited for a “jamming” purpose. Recent work on these moths and their bat predators has teased apart a possible “warning” effect and a “jamming” effect by using bats familiar with the moths and actively pursuing them as prey. Bats fully intent on capturing the moths were hampered in their ability to do so when the moths were capable of ultrasonic bursts. Often, the bats would lose the moth in the final stages of its attack, and revert back to “search mode” instead of successfully capturing the moth. Moths unable to employ ultrasonic countermeasures (through surgical removal of their tympanal organs) were easy prey by comparison. This example of active interference with an echolocating predator is thus far the only example known in nature, and represents a striking example of a trait shaped through coevolution. A current hypothesis is that this “jamming” signal arose from a prior “warning” signal, since warning and/or jamming are not mutually exclusive effects for the acoustic signature of an ancestral moth species, especially if that species was not toxic to all potential predators. Faced with this innovation, the ball is now in the bat’s court, so to speak – and bats that possess variation that allows them to capture these moths more readily may leave more progeny than variants that do not. Previously, we introduced the concept of coevolution: reciprocal interactions between two species that act as major evolutionary influences on each other. In some cases, two species act not only as the primary influence on the other, but do so in a close, long-term relationship. Such relationships are examples of a symbiosis (literally, “living together”). As one might expect, symbiotic relationships are excellent places to explore coevolution. In fact, the closeness of a symbiotic relationship can lead to what is known as cospeciation – the simultaneous speciation of two species in tandem as a consequence of their close association. Beyond the matching pattern of speciation, the divergence times for human and chimpanzee body lice agrees with the speciation times for their hosts. Human and chimpanzee body lice separated approximately 5.6 million years ago, which falls within the range of times estimated for the human / chimpanzee divergence (4.5 – 6.0 million years ago), though this estimate is based on a very limited sample of gene sequences from the louse species. In contrast, the split between the common ancestral population of the two Pendiculus species and Pthirus (~11.5 million years ago) is not as well matched to the corresponding primate speciation event (the divergence of the gorilla lineage from the lineage leading to the common ancestral population of humans and chimpanzees at 6.0 – 8.0 million years ago). The evidence thus suggests a straightforward cospeciation event for Pendiculus humanus and Pendiculus schaeffi, but a more complex history for Pthirus. One possibility (aside from the observation that this date is also based on a limited data set) is that the louse and primate divergence times are correct, with the louse event occurring prior to the primate event. One way for this to happen is for the parasite to maintain separate populations within the host population for a long period, perhaps facilitated by switching between closely related hosts. Interestingly enough, there is evidence for such an effect within present-day populations of Pendiculus humanus – there are populations of the parasite that appear to have been separate for longer than our species has existed. An ancient lineage of Pendiculus humanus found only in the New World (i.e. North and South America) diverged from Old World Pendiculus humanus about 1 million years ago and arrived with humans migrating over the Bering land bridge from Asia. This ancient split between Pendiculus humanuslineages predates the arrival of our own species in the fossil record at about 200,000 years ago. One hypothesis for how it is that we carry such an ancient lineage of an obligate parasite is that some human populations acquired it from a related hominid lineage in the Old World prior to migrating to North America – an example of host switching. This hypothesis recently received support from genomics evidence indicating interbreedingbetween some human populations and other hominid groups (Neanderthals and Denisovans), which would provide the necessary close contact for a host switch, especially if the Neanderthal and/or Denisovan lineages were previously in contact with even older groups such as Homo erectus. It will be interesting to see if this hypothesis continues to be supported as more genetic data from human louse populations is gathered and analyzed. In contrast to parasitism, mutually beneficial symbiotic relationships can arise between species. One example of this effect (known as mutualism) is the striking relationship between some plants and their pollinating insects. Some plants and insects have a reciprocally obligate relationship: the insect is the sole pollinator for the plants, and the plant is the sole food source for the developing insect larvae. In this case the relationship is beneficial to both species – the plant receives the benefit of having a highly efficient pollinator, and the insect receives a food source tailored to its larvae. One widespread group of plants that uses obligate insect pollinators are the numerous species of fig trees. Almost every fig tree species (of the hundreds worldwide) hosts a separate species of fig wasp that acts as its obligate pollinator and in turn is restricted to its fig tree host for its larval development. Fig wasps need to develop inside a developing fig fruit, and fig trees need their wasp species to pollinate them. Not surprisingly, this mutualistic, symbiotic relationship is also a recipe for cospeciation – recent analysis of over 200 fig / wasp pairs (of the over 750 species pairs known worldwide) strongly supports cospeciation for the vast majority, with only limited host switching between closely related groups. For these wasps, the widespread diversification of their host trees has been a major force in their evolution. Next, we’ll explore an even deeper level of symbiosis –endosymbiosis, where one species lives within the other – and examine the evidence that modern-day mitochondria and chloroplasts are descended from free-living prokaryotes. We have introduced the concept of mutualism: a symbiotic relationship where both species benefit the other. In the case of figs and fig wasps, the one species (fig trees) provides a home for the other (fig wasps) for a portion of its life cycle. Despite the closeness of this sort of mutualistic interaction, figs and wasps are, of course, recognizable as separate entities. Indeed, there is evidence that some wasp species have shifted to new host trees in the past, demonstrating their (partial) independence. Some mutualisms, however, are so old and so intertwined that the two entities are no longer considered separate. Mitochondria and chloroplasts – the organelles responsible for energy conversion in eukaryotes – are thought to be examples of this sort of ancient mutualism. Numerous lines of evidence support the hypothesis that these organelles are the descendants of endosymbiotic (literally, “living together, within”) bacteria. Mitochondria and chloroplasts as endosymbionts? Chloroplasts, on the other hand, are organelles capable of photosynthesis (using light energy to perform energy conversion). Whereas all eukaryotes have mitochondria, only some eukaryotes have chloroplasts (green algae and plants). Both mitochondria and chloroplasts have features that were somewhat puzzling to biologists for a long time. Both organelles have their own genomes (a closed circle of DNA), and use protein translation machinery (ribosomes) that is distinct from cellular ribosomes. Both also divide through binary fission, and do not participate in exchange of membrane vesicles with other organelles. Closer examination of these (and other) features showed that in all cases these similarities grouped with bacteria rather than with eukaryotes: bacteria have circular DNA genomes; mitochondria and chloroplast ribosomes are more similar to bacterial ribosomes; and binary fission is a bacterial mode of replication. Gradually, the hypothesis that mitochondria and chloroplasts are the endosymbionic remnants of once free-living bacteria has become a theory in the scientific sense of the word. Recent whole-genome sequencing of mitochondria groups all mitochondrial lineages as more closely related to each other than any is to free-living bacteria (the closest living relatives being the SAR11 group of alphaproteobacteria), supporting the hypothesis that the endosymbiosis event that led to mitochondria happened once, very deep in evolutionary history (around 1.45 billion years ago or more, either prior to or shortly after the origin of eukaryotes). Similarly, chloroplast genomes group together as closest relatives when compared to existing cyanobacteria, their closest free-living relatives. Until recently, all chloroplasts were thought to be the descendants of a single endosymbiosis event deep in evolutionary time (approximately 1 billion years ago). Work on the amoeba Paulinella chromatophora, however, has provided strong evidence for a second, independent endosymbiosis event producing a photosynthetic organelle. P. chromatophora is named for its two photosynthetic “chromatophores,” endosymbiotic, photosynthetic structures that bear an even more striking resemblance to free-living photosynthetic cyanobacteria than chloroplasts do. The DNA of P. chromatophora chromatophores does not group closely with chloroplasts, but rather with another free-living cyanobacteria lineage. Morphologically, P. chromatophorachromatophores retain some of the bacterial cell wall structure of their cyanobacterial ancestors that chloroplasts have lost. Additionally, the mechanism that shuttles proteins made from the host genome into the chromatophores is distinct from the mechanism used for host / chloroplast protein shuttling. Functionally, the amoeba is dependent on the chromatophores for photosynthesis, and the chromatophores cannot survive as free-living cyanobacteria. Sequence analysis indicates that several key chromatophore genes have been transferred to the host (nuclear) genome, a feature seen with mitochondria and chloroplasts as well. DNA sequence analysis to estimate the time of the chromatophore / cyanobacteria divergence (and thus the endosymbiosis event) places it in the range of 60 million years ago – a mere blink compared to the billion years since the ancestors of chloroplasts entered their host cell. This second endosymbiosis event is thus another example of convergent evolution – broadly similar in that it produced an obligate, endosymbiotic, photosynthetic organelle, but divergent in the details: a distinct cyanobacteria was the ancestral free-living organism, and the details of the molecular integration of host and endosymbiont are different. The endosymbiosis events leading to mitochondria and chloroplasts were major landmarks in evolutionary history. In the next post in this series, we’ll examine another major event in evolution – the so-called Cambrian “explosion”.